Information Tidbits in the social fabric! 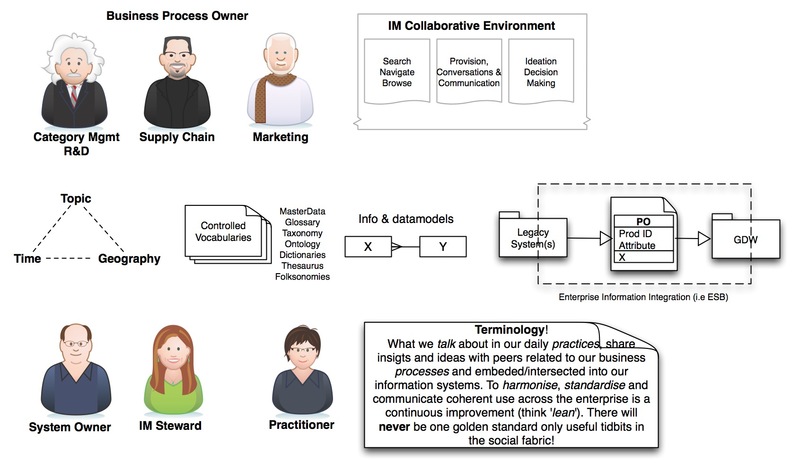 Terminology, is what we talk about in our daily practices, share insigts and ideas with peers related to our business processes and embeded/intersected into our information systems. To harmonise, standardise and communicate coherent use of terms across the enterprise is a continuous improvement (think ‘lean‘). There will never be one golden standard only useful tidbits in the social fabric! Lately we have seen an abundance of ‘terminology’ feeds into the ‘social’ realm. As Social Business, or Social Collaboration. This is an obvious tautology, never the less it comes into fashion 😉 In my research practice I have the refined use of terminology amongst peers, to get acceptance in relevant contributions to my part of the world, same goes when I do put on the business suit (like Mr Walker contrasting the Phantom). Same thing with different ways of communicating! I took a detour into my reference litterature to grasp things ahead of me, and realised still how crispy and mindblowing the book ‘The Social Life of Information‘ is! Even if it was written during the haydays of 1998 (internet era or dot com) all things match with todays business arena. When we talk about the emerging social intranet (or social collaboration, or enterprise 2.0, etc), we as IS/IT-saviours get hooked into TOOLS! and forget that the social fabric that makes up any organisation. People will undertake predictable irrational uses. Communication and conversations amongst people is all about sense-making to cope with your everyday persuit. Hence in the midst of this resides our terminology, the way we express our self, manifest our agreements and rule out our policies and procedures to work together in a polite and easy manner. To narrow down the scope for this post into the theme around social intranet. I took the itchy part called Findability! One albatross around his neck, that any intranet manager could testify is intranets poor findability. Pragmatically we all agree that it should be easy to find things of high relevance to my needs, second it would be sweet if it also were simple to contribute in such a manner that I add things with high quality. And not dilute the information landscape with abundance of crap! So findability isn’t a quest for a new search engine of preferred taste, it is all about pragmatic use of search patterns, and provision with good/simple to use information management practices. In all this our terminology is the glue to sense-making. Hence if one took a snippet of the social intranet tools and used it to cope with ‘the enterprise terminology‘! These terms are heavily embedded into the ICT tools we use. Be it in the Business Applications arena (structured data) or Enterprise Content Management arena ( unstructured data). Here in this hot-spot we really could get attention, engagement and lively debates about the use of words in the enterprise, and their different interpretations. Social as anything! and for a good cause. With this practice in place (networked governance), the future state of enterprise linked data makes sense in everyday business. And we would also get pathways for our wayfinding to corporate culture and social fabric via the conversations around terminology….set into action in search engine refinement, guided classification means in any provision and so forth. All in all improving the information architecture and obviously findability…. This entry was posted on Thursday, May 19th, 2011 at 9:44 pm and is filed under Enterprise 2.0, information management, social networks, Uncategorized. You can follow any responses to this entry through the RSS 2.0 feed. You can leave a response, or trackback from your own site. 3 Responses to Information Tidbits in the social fabric!